New Delhi, Dec 28 (PTI) India's success against top-ranked nations this year has instilled a new self-belief and helped the women's hockey team shed its underdog tag, feels skipper Rani Rampal. Indian women's hockey team won a historic silver at the 18th Asian Games and another silver at the Asian Champions Trophy this year. They also finished at the quarterfinals at the World Cup in London and ended at the fourth place at the Commonwealth Games. "Though we would have preferred to win the gold medal at the 18th Asian Games Jakarta-Palembang as well as the Asian Champions Trophy, I believe overall, we had a good outing in 2018," Rani said. "Beating England 2-1 at the Commonwealth Games, a 1-1 draw against them at their home turf during the Women's World Cup in London and a 0-1 loss to Australia in the semi-final at Gold Coast has given the team tremendous confidence and self-belief. "We can give top teams a run for their money in big-ticket tournaments. We are no longer considered an underdog team by our opponents and that's our biggest takeaway from 2018." India's quarterfinal finish at the women's World Cup for the first time in four decades has spurred their world ranking to a career-best world no.9 and Rani feels the team has great potential to improve further in future events. "The brighter side of 2018 was our U-18 team doing well at the Youth Olympic Games where they won a silver medal. With the fresh talent coming into the core group, the seniors too want to improve their individual performance to stay relevant to the team," she said. "There is healthy competition within the core group and the pool of players is bigger now with a good mix of youngsters and seniors who have played together for more than four years. "I'm quite confident if we continue to improve at the pace we are at this moment, we stand a good chance of climbing up the World Ranking further." 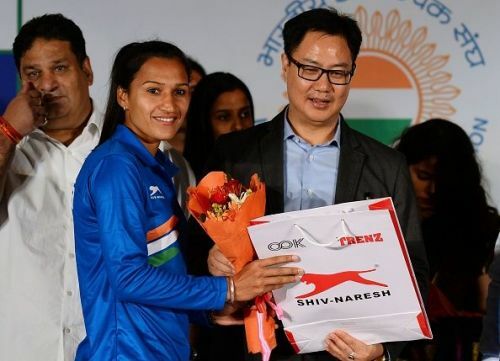 She also said that working with an elite hockey star like Glenn Turner of Australia who was invited by Hockey India to conduct a special camp for forwards has helped the team tremendously. "In December, we had a special coaching camp for strikers where we worked under Australian great Glenn Turner. He gave critical inputs after watching us play closely. "Though he did not drastically change how we play, his detailing and inputs were extremely helpful in the positioning of forwards within the striking circle. "We had struggled in this area during our past events, missing scoring opportunities. Now when we return to the National Camp, we will further ensure what we learned from him is implemented," she said. Speaking of the year ahead, Rani said the team's ultimate goal will be to qualify for the 2020 Tokyo Olympic Games. "We will be reporting to the National Camp in the first week of January and begin our preparations in this crucial Olympic cycle where we will be playing Olympic Qualifiers," Rani said.